I had been in a bit of a routine with my reading, firmly in the young adult and middle-grade camps, when I picked up When You Reach Me. There were many reasons for this, from the practical (I was grabbing a few of my son’s library books when he’d finished with them) to the profound (there are excellent YA and MG novels out right now, and they often address significant cultural and personal issues with grace, insight, and forthrightness). I also believe that children are our future [I’m looking at you, Whitney Houston]. Adults should be aware of the concerns they are facing and how they are coping with them. 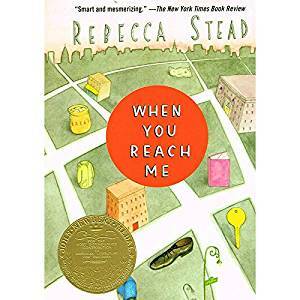 That said, my latest MG book to review was When You Reach Me, by Rebecca Stead, published in 2009 and winner of the 2010 Newbery Medal. The novel is an unabashed homage to Madeleine L’Engle’s A Wrinkle in Time, made timely again by the star-studded film recently released. My one regret is that I didn’t read WIT before When You Reach Me (rectified soon after). The protagonist, Miranda, refers to WIT–her favorite book, now beat-up from having been read a hundred times–throughout the story, even retelling the tale to Belle, a local shopkeeper who keeps Miranda pumped full of vitamin C when she waits for her mom to get off work. Belle is one of half a dozen adult characters who are fairly well drawn, particularly for grown-ups seen through a twelve-year-old girl’s eyes. Others–Mom, Mom’s boyfriend Richard, Jimmy the sandwich shop owner, Wheelie the school secretary, Annemarie’s stay-at-home dad, and Louisa the neighbor/friend–exhibit exactly the sort of details you would expect her to notice: the things that most influence Miranda herself, from the bags of potato chips that Louisa brings home from the nursing home where she works to the sailing knots Richard teaches Miranda how to tie. An overarching and organizational focus of the book is Miranda’s mom’s acceptance as a contestant on The $20,000 Pyramid and her family’s help in the preparations. I loved that Stead titled the chapters in the same vein as the show’s categories: “Things That Stain,” “Things You Keep Secret,” “Salty Things.” Even readers unfamiliar with the show will catch on to this trend after a bit, and they provide an intriguing form of foreshadowing, keeping us guessing about what those things are that stain, for instance, as we read that chapter. A major theme that Stead probed deftly is friendship. Miranda finds herself held at a distance by a childhood best friend and explores a number of new relationships, one with a girl who hides a disease requiring a special diet and seems to be distancing herself from her own childhood friend. Miranda discovers that the impressions she has formed about peripheral figures in her life are not always justified, and things are never as simple as they seem. The book is categorized as science fiction and mystery. To be honest, the sci-fi was pretty soft and the majority of the book was realistic, with only the one thread of time travel (and if that’s a spoiler, refer back to the homage to Madeleine L’Engle). Now the mystery was very well done. It was introduced in the first two pages, with Miranda addressing the author of the mysterious notes she’s been receiving. I was really impressed with how the author wove the various strands of stories together. I knew they had to be related in the end, but it was quite delightful to come to the realization at the same time as Miranda, to see all the pieces fall into place and reach their terrible, wonderful conclusion. In the climactic moments, Miranda lifts the veil and grows wise beyond her years, simultaneously accepting a terrible burden and a wonderful gift. If you have used the Wrinkle in Time movie as an excuse to read or reread that book, I don’t think you could do better than to follow it up with When You Reach Me.